The inside story of DSA’s dramatic ascent. Visiting Julia Salazar’s north Brooklyn campaign office one warm July weekend, I’m greeted by a volunteer with a spreadsheet. Like nearly everyone else in the converted coffee shop, she’s a member of the Democratic Socialists of America (DSA), and she asks me cheerily if I’m there to canvass. I’m not, but if I were, I would be instructed to make my way to a training session on the sunbathed patio out back that is scattered with half-full bottles of sunscreen. After that—in the span of just a half-hour—I would know everything I need to know about how to help elect a card-carrying socialist to the New York state Senate. If Salazar makes it to Albany, she will join the ranks of 42 DSA-endorsed candidates who are now or will soon be serving in offices from the Moorhead, Minn., school board to Capitol Hill (that is, if Alexandria Ocasio-Cortez wins the general election as handily as she did her primary in New York’s 14th Congressional District). So far this year, local chapters have endorsed at least 110 candidates. DSA may soon have 50,000 members across 200 local groups in all 50 states—up from 6,000 members in 2015. 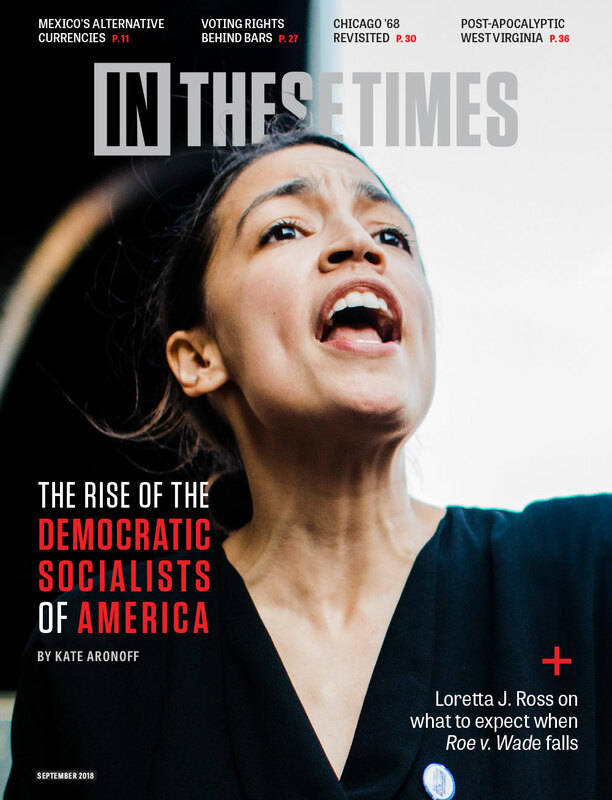 The surge in freshly minted socialists came in three waves: First, those energized by Bernie Sanders’ primary run; second, those brought in by Donald Trump’s election and the Women’s March; and third, those inspired by 27-year-old DSA member Ocasio-Cortez’s primary victory in May over incumbent—and Democratic heavyweight—Joe Crowley. So what is DSA, exactly, and what is it doing with this growing army? DSA’s electoral work has attracted national media attention in the wake of Ocasio-Cortez’s historic win. Yet it’s just one part of a bottom-up approach to politics that sees the ballot box and state power as tools for advancing toward a more radically democratic society. 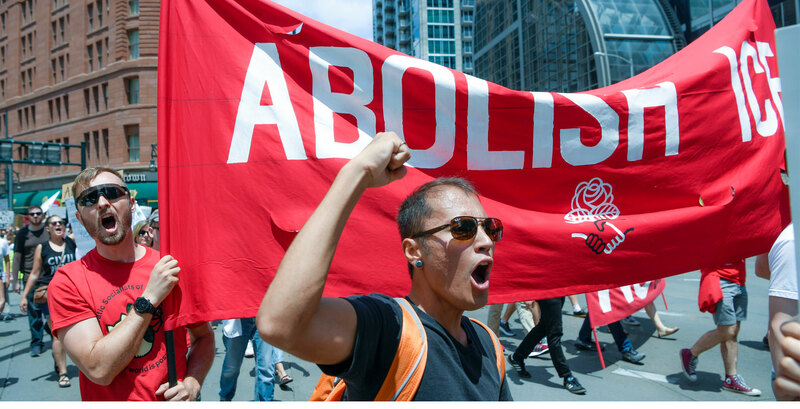 Members—most of them millennials, in small towns and big cities in every corner of the country—are engaged in everything from occupying Immigration and Customs Enforcement (ICE) offices to evangelizing about Medicare for All. Many reporters have tried to divine what DSA believes, be that the group’s policy prescriptions or its ideology. DSA, though—to crib from Karl Marx—isn’t looking merely to interpret the world, but to change it, campaign by campaign, door by door. What’s made DSA’s ascendance remarkable is less its analysis of capitalism than its ability to put people angry about capitalism to work. The 1980s would prove a tough decade for left politics, the 1990s and 2000s even more so. DSA shed members and closed chapters around the country as a few loyalists and a steady trickle of young recruits kept the organization running. Enter Bernie Sanders’ primary campaign and his stalwart identification as a “democratic socialist,” a surprise boon for an organization with those two words in its name. DSA’s commitment to being a pluralistic, “multi-tendency” organization also meant it was open enough to accommodate thousands of newcomers. Democratic socialism itself has always been a heterodox term, encompassing everyone from ideological Trotskyists to New Deal Democrats. The surge of new, mostly 20-something members include anarchists, Marxist academics and—most numerously—political neophytes excited about Sanders’ message and frustrated with the Democratic establishment. Our vision is of a society in which people have a real voice in the choices and relationships that affect the entirety of our lives. We call this vision democratic socialism—a vision of a more free, democratic and humane society. Members I spoke with took this to mean everything from taking public goods like healthcare off the private market (along the lines of Scandinavian social democracies) to worker-ownership of the means of production. Central Iowa DSA co-chair Caroline Schoonover was among many to say that democratic socialism means “taking power from the few and giving it to the many.” All saw small-d democracy—people having a say in the decisions that affect them—as central, both in politics and workplaces, and in DSA itself. For this story, I spoke with around two dozen DSA members from chapters around the country. The primary source of their excitement was that DSA chapters seemed to be actively working on something, not just sitting around reading Marx. Like the citizen action group Indivisible, which also exploded after the election, DSA let people shake off a feeling of helplessness about the political climate and roll up their sleeves. DSA also offers a community. Chapters host regular beach days, parties, fundraisers and social events, like Metro D.C. DSA’s recent “No ICE Cream Social.” If Indivisible was able to connect many alienated, middle-class suburbanites jarred out of their political comfort zone, DSA has provided a home for tens of thousands of downwardly-mobile, debt-ridden millennials grappling with a system that simply isn’t working for them. Adam Shuck and Arielle Cohen, 32 and 29, joined Pittsburgh DSA in its infancy; Shuck was among the seven people who first met at a bar in 2016 to talk about getting the chapter together. Each was energized by Barack Obama’s 2008 presidential campaign but disillusioned by his presidency. “I thought we were going to see some kind of New Deal,” Shuck says. The frustration led him at first to join the International Socialist Organization before the Sanders campaign brought him to DSA. While a student at SUNY Purchase, Cohen grew disillusioned with the sausage-making and compromise that created the Affordable Care Act, and organized with Occupy Wall Street before moving to Pittsburgh and finding her way to DSA. Now, Shuck and Cohen co-chair the Pittsburgh chapter. Pittsburgh DSA held its first general meeting in December 2016 with around 100 people. Now it has a dizzying number of working groups: a health justice committee campaigning for Medicare for All; reading groups tackling Marx and Engels; an anti-imperialism committee lobbying for legislation criticizing Israel’s occupation of Palestine; a socialist feminist working group exposing crisis pregnancy centers; an ecosocialist group fighting the privatization of the city’s water and sewer system; a housing rights group pushing for protections for renters; and a number of inward-facing groups handling tasks like recruitment and communications. The chapter also brought the newly revived DSA one of its early electoral victories, rattling the local Democratic machine. In December 2017, the group threw its weight behind Summer Lee’s campaign to represent House District 34. In the May primary, with the help of DSA and groups like Our Revolution and the Sierra Club, Lee, 30, a recent law school grad, beat Paul Costa, 57, a 19-year incumbent and member of a dynastic Pittsburgh Democratic family. Lee had experience working on school board races and on a coordinated campaign to elect Katie McGinty governor and Hillary Clinton president in the 2016 general election, and she was impressed with DSA’s electoral work on Mik Pappas’ judicial campaign. Pappas ran on a platform of ending cash bail and working to end mass incarceration, and won in a landslide, with the help of a dedicated grassroots turnout effort staffed in part by DSA members. “They were running 20 or more canvassing shifts a week,” says Lee. “I had never seen that type of energy around magistrate elections. I realized that ideologically we aligned.” She joined DSA shortly thereafter and sought them out as her first endorsement. It wasn’t easy. DSA’s candidate endorsement process is a microcosm of its baked-in commitment to direct democracy. For every decision, at every level, there’s deliberate space for members to duke things out, combined with a commitment to ultimately supporting the group decision rather than splitting off into rival factions. The very question of whether to engage in the electoral process—and in particular, to work within the Democratic Party—remains fraught, with many members skeptical of investing limited organizational resources into elections rather than base-building. New York City DSA hotly debated whether to endorse Gov. 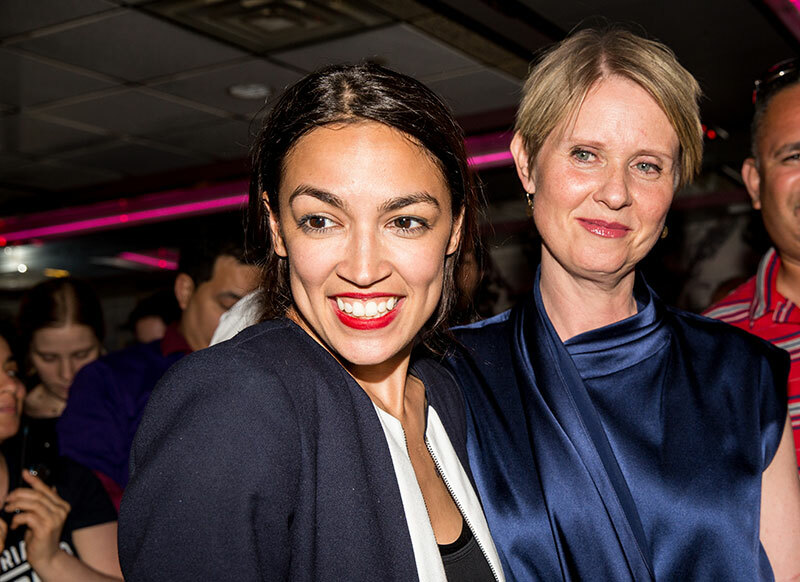 Andrew Cuomo’s challenger from the left, Cynthia Nixon, after she declared herself a democratic socialist. Several dozen DSA members signed a “vote no” statement arguing that universal healthcare and rent control will be won not by electing candidates to office but by “building working-class power that holds [them] accountable,” citing the successful teachers’ strikes in Republican states. In late July, NYC-DSA officially endorsed her after an extended series of debates. While the endorsement process varies from chapter to chapter, in some cases—including Lee’s—the first step is filling out a lengthy form with questions from each of the chapter’s working groups. Typically, one is whether the candidate identifies as a socialist. Members weigh that alongside specific policy questions (“Do you support universal rent control? Abolishing the police?”) and a range of other concerns: How much of an impact could the chapter have on the race? How will it build the chapter’s capacity and the movement to challenge the capitalist class? Next comes the interview process. After filling out Pittsburgh DSA’s questionnaire, Lee was interviewed by a roomful of members. The group voted to endorse both Lee and Sara Innamorato, a state representative candidate, and the two supported one another’s campaigns. Ocasio-Cortez, in New York, jumped through even more hoops. Because her congressional district spans the Bronx and Queens DSA chapters, she had five interviews: with the electoral committees and membership of each branch, and then the citywide convention. “We put her through hell,” jokes Michael Kinnucan, a DSA member now co-managing the state Senate campaign of Julia Salazar (whom the organization endorsed alongside Ocasio-Cortez in a parallel process). Salazar, 27, estimates that some 800 DSA members live in and around her district, which has translated into hundreds of volunteers spreading the word about her September primary. Even in her short time with the group (she joined in late 2016), she’s seen a change in how fellow leftists relate to electoral politics. “I think part of it is people seeing the term ‘democratic socialist’ normalized in the electoral realm, through Bernie mostly, at least initially, and so seeing it as an actually viable strategy,” she told me between knocking doors. Thanks in part to the Sanders campaign and Ocasio-Cortez’s stunning upset, that goal feels more within reach now than it has since the days of the Socialist Party’s Eugene Debs. Big, universal programs like a federal job guarantee or Medicare for All draw overwhelming popular support. And small, local races offer an opportunity for the grassroots to tip the balance. Establishment candidates in Democratic-controlled cities effectively depend on low turnout. Their political consultants tend to rely more on advertising and glossy mailers, and less on actually talking to people—particularly people who don’t usually vote. Mobilizing even a few thousand new voters in that context, then, is a fairly straightforward formula for victory. When DSA member Lee Carter won a seat in Virginia’s House of Delegates in November 2017, he beat his Republican opponent by 9 points—a margin of 1,850 votes. Depending on the city, DSA can offer a large, self-organized volunteer base to candidates who navigate its endorsement process. Pittsburgh DSA estimates that its volunteers knocked on some 70,000 doors through the course of Lee’s campaign. Turnout in Lee’s district was 14 percent higher than in others around Allegheny County and 54 percent higher than in the last midterm election. Still, it’d be nearly impossible for DSA-endorsed candidates for higher offices to make do with only DSA’s support, and they often work alongside other organizations like Justice Democrats, Our Revolution and the Working Families Party—especially for bigger races. Justice Democrats and Brand New Congress, for example, convinced Ocasio-Cortez to run and helped staff her campaign, and she gained the backing of Black Lives Matter-Bronx and People for Bernie Sanders, among others. Ocasio-Cortez’s campaign reached 120,000 doors overall. DSA member, Hawai’i state representative and now U.S. House candidate Kaniela Ing says he hopes that DSA remains “part of an independent Left, and does not get too caught up in electoral and legislative politics”—and that it holds politicians to account, himself included. “I’m a movement candidate,” Ing says. “Hopefully my role is to help push whatever movements are building over the finish line. Elected officials really like to take too much credit for bills they pass that are really the result of the public waking up and forcing politicians to act.” He says he hopes to have regular check-ins with DSA should he make it to Washington. Electoral work also feeds into DSA’s other campaigns. Pittsburgh DSA’s membership swelled in the wake of Lee and Innamorato’s wins. “[Email] list building, data tracking, how to talk to people at the doors—that all helps build the muscle that can also help with canvassing for housing justice,” Shuck says. Prior to the victories of Carter, Lee and then Ocasio-Cortez, DSA was perhaps best known for agitating to push Medicare for All into the national spotlight—a campaign adopted by delegates from around the country at DSA’s biennial convention in August 2017 as one of three national political priorities, alongside building electoral power and stronger and more militant unions. 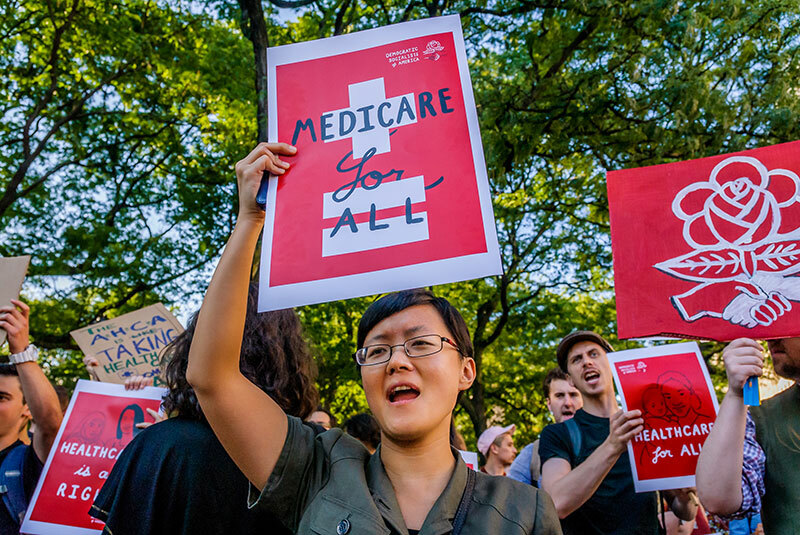 Forty-five chapters across 20 states held a weekend of action for Medicare for All in April, tabling at farmers’ markets, hosting public events and, as always, canvassing. On the labor front, DSA chapters in West Virginia, Kentucky and Oklahoma raised money for strike funds to support the militant teacher walkouts this spring, and the national DSA sent an email encouraging members around the country to contribute what they could. Many individual chapters have their own priorities, reflecting local concerns and political climates. Providence DSA, for example, is campaigning for more democratic control over investor-owned electric utilities. New Orleans DSA has focused on base-building work that includes running clinics to help people deal with medical debt, coordinating with the AFL-CIO in developing young rank-and-file labor leaders, and mending broken brake lights, an excuse used by police in the traffic stops that can be “especially perilous and life-disrupting to undocumented immigrants and PoC [people of color],” as the chapter explains on Facebook. Because there are big DSA chapters in cities with expensive housing stock—Los Angeles, Chicago and the Bay Area, for instance—the fight for affordable housing has emerged as a major priority. “Housing justice is probably the biggest issue in Los Angeles; the homelessness crisis is at a tipping point,” says Arielle Sallai, a member of DSA Los Angeles’ steering committee. 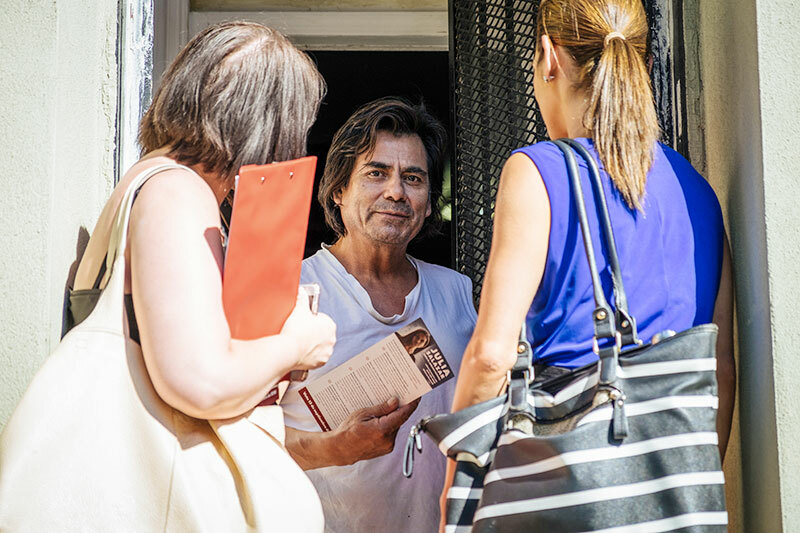 DSA-LA and other California chapters are canvassing to pass Proposition 10, an initiative on the ballot in November that would loosen a statewide limit on rent control. Similarly, Chicago DSA is supporting a campaign to overturn Illinois’ rent control ban, with the backing of Alderman and DSA member Carlos Ramirez-Rosa. On many issues, including housing and homelessness, DSA chapters are well aware that their members often don’t look like the populations most directly affected. Although DSA does not have up-to-date member demographics, it has historically leaned white and male. Coalition-building is one way to correct for this. “Housing work is a great chance to be part of a radical coalition and talk to as many individuals as possible,” Sallai says. DSA-LA has teamed up with local groups like the LA Tenants Union that have been working for years against gentrification. Noting the high proportion of women taking on leadership roles in her chapter, Esealuka suggests that all chapters equip members with the organizing skills to develop the leadership of women and people of color. Internally, many chapters have also created specific spaces, such as the national Afrosocialist Caucus or Socialist Feminist working groups, for DSA members who aren’t white or male to feel welcome and build community. 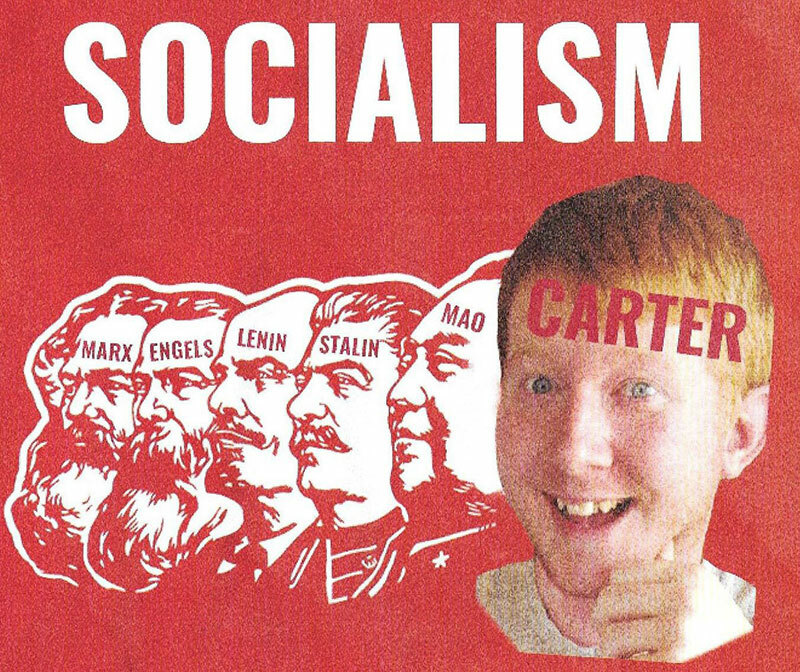 Eleven-year House of Delegates incumbent Jackson Miller sent out a red-baiting flier about his DSA challenger, Lee Carter, in 2017. Carter won anyway. 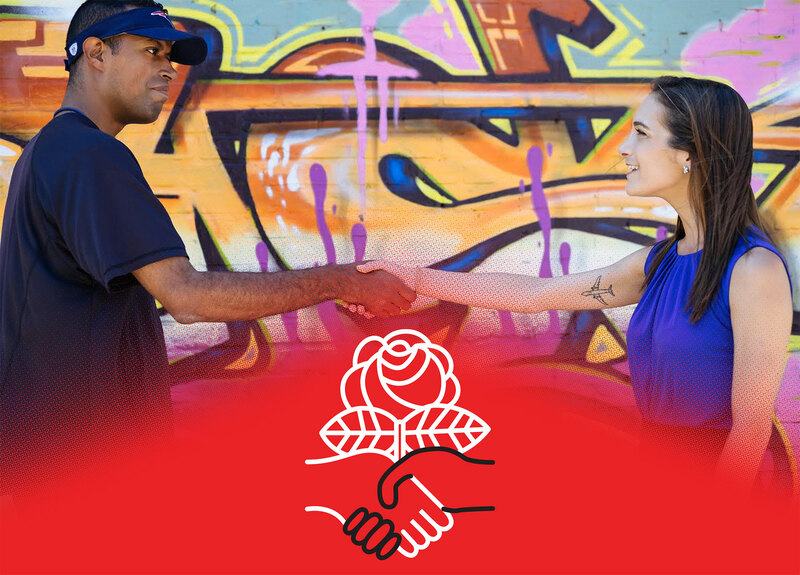 DSA candidates running for office and DSA members knocking doors, then, articulate socialism as a common sense set of practices and beliefs: swearing off corporate donations, supporting big, universal programs that promise to redistribute society’s resources more equitably, and returning decisions to the hands of the people most directly affected. As DSA makes inroads selling the public on the virtues of democratic socialism and infiltrating the halls of power, it will also figure out what to do once it gets there. For the moment, DSA members and candidates are making the road to a 21st-century American socialism by walking it—and knocking on a few hundred thousand doors along the way.